Getting to the roots of the problem. With the global population approaching seven billion and showing no sign of slowing, it’s not surprising that governments are worried about food security. A future without genetically modified crops now seems impossible. In one of the more exciting genetic modification projects, scientists at the John Innes Centre in Norwich are trying to engineer wheat that can produce its own fertiliser. There is also growing interest in understanding the role of soils and soil microbes in promoting plant growth, and we’ve written before about the role of antibiotic-producing bacteria in disease-suppressive soils. Two recent high-profile papers report a more detailed analysis of the microbiomes found in the roots and rhizosphere (the soil touching the roots) of the model weed Arabidopsis. Both studies found that the phylum Actinobacteria was one of the three most dominant groups in plant roots, and most of these were Streptomyces bacteria (streptomycetes). If you’re a regular reader of this blog, you already know that streptomycetes produce half of all known antibiotics and two-thirds of those used as medicine. It’s no great leap to imagine that these streptomycetes protect the plant roots against fungal and bacterial infections. In fact, another paper published last week reports that mycorrhiza-associated streptomycetes also protect plants against infection. 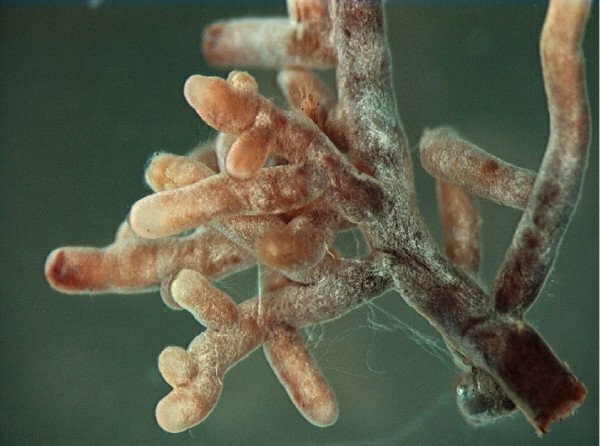 Mycorrhiza are fungi that live in symbiosis with plant roots and promote plant growth, so here we have fungi and bacteria cooperating to protect their host against, er, other bacteria and fungi. Perhaps the only surprising thing about all this is that it’s taken us so long to realise that antibiotic-producing bacteria that are widespread in the soil were being exploited by plants (and animals) long before we discovered and started using their antibiotics. Now we just have to figure out how to grow these symbiotic streptomycetes in the lab – and how they colonise plant roots and mycorrhiza – so we can exploit them even more.